Take to the skies with a band of ancient deities in Journey of the Gods. This 5 reel, 10 payline, cascading reels video slot has been created by Blueprint Gaming. Beautifully designed, it comes with a bonus round where unlimited free spins are on offer. Play on your PC, tablet or mobile device from between 10p and £500 per spin. 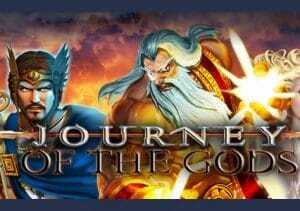 Blueprint Gaming are one of the better developers when it comes to design and that’s certainly the case with Journey of the Gods. A sun-kissed, cloud-filled sky forms the backdrop the reels. Joining the lower value royal values are jewels, crosses and 3 superbly drawn ancient deities. The best of the celestial payout bunch is the Journey of the Gods logo. Land 3, 4 or 5 of these in combination and you can look forward to a payday of 5, 50 or 500 times your total bet. Helping to create those winning opportunities is the sun god emblem which is the wild. This doesn’t offer any pays in its own right but it does substitute for all other symbols. It’s usually here that we write apart from the scatter. Except there isn’t a scatter. There is a Free Spins feature though – to trigger it, you’ll need to get on a run of cascading wins. After a successful combination hits, the winning symbols are removed and new ones drop down and replace them. These cascades keep on coming as long as a new winning combo is created. Land 4 or more cascade wins in succession and you’ll activate the Free Spins feature. The higher the number of consecutive cascade wins the bigger the number of free spins awarded. It starts at 10 for 4 cascades in a row followed by 20, 30, 40 or 50 free spins if you manage to land 5, 6, 7 or 8 winning cascades. The cascading reels game engine is in play during those free spins too. You can re-trigger more free spins too if you get on a roll. That’s it as far as features go. The gameplay here is relatively simple for a Blueprint Gaming video slot. It works well enough though with the cascading reels delivering plenty of base game action. This isn’t the most volatile game you’ll come across. The variance is in the medium range. Saying that, you can pocket 5,000 times your bet on every single spin. Journey of the Gods is a simple, well designed game. The visuals are excellent and the sweeping orchestral gives the game an epic quality. Other video slots from this developer offer more variety on the features front. For straightforward myth and legend themed action, Journey of the Gods does the job perfectly well. I would also opt for Vikings Unleashed MegaWays (from Blueprint Gaming) which is just excellent.